The Cirrata contains about 40 species many of which are poorly known and of uncertain status. The finned octopods are of medium to large size (up to 1.5 m total length, although there is a photographic record of one estimated to be over 4 m in total length: Voss, 1988). The body is usually gelatinous and strongly foreshortened. The mantle opening is reduced and swimming via jet propulsion seems to have been abandoned. Fins are present and are the primary means of locomotion. The fins attach to and are supported by the internal shell which has an unusual consistency (i.e., cartilage-like structure) and an unusual shape (i.e., a U, V or saddle-shape). The arms have one series of suckers down the midline of each arm and a series of cirri along each side of each arm (i.e., two cirri per sucker). The cirri alternate with the suckers along the arm length. The web is usually well developed and may reach the tip of the arms. A hectocotylus is absent but the arms of some species exhibit sexual modification; enlarged suckers are the most common modification. The diameter of the largest of these suckers is a good external indicator for maturity in males of some species. The spermatophores have lost the entire ejaculatory apparatus and form sperm packets with an operculum (Villanueva, 1992). The eggs are very large and enveloped in a tough egg covering that is secreted by the oviducal gland. 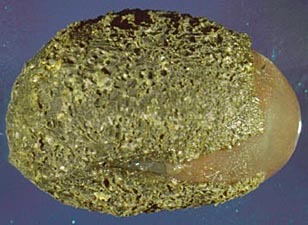 Where known, eggs are laid singly on objects on the ocean floor. Hectocotylization absent, sexual dimorphism of suckers present in some taxa. Arms with internal horizontal septa. Suckers arranged in a single series. Fins present. *Fins in cirrates are measured differently than in decapodiforms. See the glossary for details. Shell with cartilage-like consistency, transversely elongate in U-, V- or saddle-shape. Sperm packets present rather than typical spermatophores. Posterior salivary glands often on or in buccal mass. Radula often reduced or absent. Figure. Reduced radulas from two Grimpoteuthis boylei. Photographs from Collins (2003). One of the most distinctive features of this group and the feature from which it derives its name, is the presence of cirri. The oral view of the arms and web of a cirrate below barely shows the cirri lining the arms but the insert show the cirri clearly. The cirri are the long, slender, muscular papillae lining the arm. The exact function of the cirri is unknown but they are thought to play a role in feeding. Figure. Oral view of a cirroteuthid cirrate photographed off Hawaii from a submersible at 1100 m. Insert is a close-up photograph of the same cirrate. Photographs courtesy of the Hawaii Undersea Research Laboratory. Hunt (1996) observed a small Grimpoteuthis in an aquarium over a two month period. On occasion this cirrate apparently fed by trapping brine shrimp nauplii by enclosing a volume of water that contained nauplii with the web. The action of cirri, however, could not be observed. Usually the cirrate collected adult brine shrimp with its extended arms and web as the animal sank through the water and then trapped them against the aquarium floor. Sometimes following this trapping, individual brine shrimp were drawn under the skirt of the web while the octopod was on the bottom. When a portion of the web was high enough off the bottom, Hunt observed metachronal waves of moving cirri with waves moving toward the mouth. He suggests that the cirri were creating currents that were used in feeding. Vecchione and Young (1997) found large glands in the lips that surround the beaks in the pelagic cirrate, Stauroteuthis syrtensis, and suggest that, in this species at least, mucous also plays a role in the capture of small prey. Note also the pigmentation of the large web (brown and white pattern) of the cirrate in the above photograph which is peculiar for an animal living in deep water where sunlight is absent. While luminous organs have been found in only one cirrate species (Stauroteuthis syrtensis; Johnsen, et al., 1999), As yet unrecognized bioluminescence could provide an explanations for the odd pigment pattern. Hoyle (1904) described an unusual cirrate that he called Froekenia clara. Its most distinctive feature was the absence of a web. Such a feature, if true, would be unique in the Cirrata. However, many cirrates have very delicate webs that are easily damaged during capture. F. clara was badly damaged and had lost most of the arm suckers and cirri. We could safely assume that the web was lost as well if Nesis (1982/87) hadn't indicated that he had seen a new species of this genus. Perhaps Nesis, like Hoyle, was mislead by damage to his specimen. We consider Froekenia clara to be a species dubia. O'Shea (1999) proposed major changes to the classification of the cirrate octopods. Unfortunately the Cirrata is still so poorly known that a definitive classification is unattainable. We subsequently dropped O'Shea's families Luteuthidae and Grimpoteuthidae and placed their genera in the family Opisthoteuthidae. Collins and Villaneuva (2006) revised the classification of the Cirrata based largely on their own anatomical work and a molecular phylogenetic study by Piertney, et al. (2003) based on mitochondrial 16S DNA sequences. Figure. Simplification of the diagram from Piertney, et al., 2003. Their's is the only phylogenetic study that has been published on the Cirrata. Collins and Villaneuva split the Opisthoteuthidae into three families (Opisthoteuthidae containing Opisthoteuthis, Grimpoteuthidae containing Grimpoteuthis, Luteuthis and Cryptoteuthis, and Cirroctopodidae containing Cirroctopus). Their evidence for placing Cirroctopus in its own family is good on the basis of morphology and OK on molecular support (70%) and is followed here. However, placing Grimpoteuthis, Luteuthis and Cryptoteuthis together at the family level rests on a weaker foundation. They have demonstrated morphological features in common among these three genera and DNA data gives a marginal support (i..e., 52%) for this clade. These authors also placed Stauroteuthis within the family Cirroteuthidae, along with Cirroteuthis and Cirrothauma, rather than leaving it in its own family. There is little doubt that these three genera have much in common morphologically and Piertney's molecular tree gives the clade support of 98%. However major differences exist between Stauroteuthis and the other two genera in the shape of the shell, the structure of the gills and the form of the anterior end of the mantle. We suspect that there are many unknown cirrates and that systematics of the group is far from mature. As a result, we retain a more conservative taxonomy for the present while acknowledging the important advances in understanding species and generic relationships provided by Collins and Villaneuva (2006). The cirroteuthid Cirrothauma murrayi is essentially blind. The eyes have no lens and the retina is degenerate but could still respond to light (Aldred et al., 1983). This is the only cephalopod known to be "blind." Cirrates do not brood their young. Instead, they spawn large eggs in tough egg cases (up to 24 mm in length) that, where known, are attached to objects on the ocean floor, and the young presumably adopt the adult mode of life immediately after hatching. Figure. Left - The broken egg case of an unknown cirrate taken in a bottom trawl, where it was found among sponges, from the R/V Meteor in the Angola Basin at a depth of 5400 m. The chorion can be seen protruding on the right side. 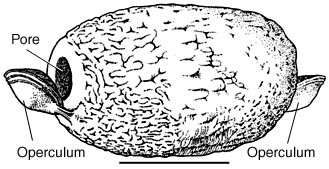 Right - The empty chorion and the advanced embryo, ca 10 mm from mouth to tip of mantle with very large fins, that was removed from it. A portion of the egg case in remains in the upper right. Photographs by F. J. Cristobo, provided by U. Piatkowski. At least in Opisithoteuthis both males and females are mature over a large range of size; the eggs in the ovary are of different size classes; mature eggs are stored in the oviduct and the oviducal gland with one to a few eggs released at any one time (Villanueva, 1992). These features suggest that spawning is continuous and may last over several years (Villanueva, 1992). The male reproductive system in cirrates differs greatly from the male system of Incirrates. The reproductive modifications are related to the absence of typical spermatophores in this group. In cirrates, the spermatophore is just a simple container, sometimes called a sperm packet, filled with sperm. The ejaculatory apparatus and cement body are absent. Figure. Sperm packet (= spermatophore) from Opisthoteuthis agassizii. Drawing from Villanueva, 1992. The animals swim by flapping their fins or by medusoid contraction of the arm-web complex and not by mantle contraction (Vecchione and Young, 1997). These swimming modes may be energetically efficient but are slow. A "secondary" web, present in some species, is formed by the fusion of the aboral muscles of the web which are detached from the aboral musculature of the arm. This allows the web to "lift off" the arm except for the stretched oral side of the web that forms a septum (the secondary web) between the web and the arm (Vecchione and Young, 1997). This arrangement allows effective "ballooning" of the web in which the web is inflated by surrounding a large volume of water. This behavior is thought to have a defensive function (Boletzky, et al., 1992). Opisthoteuthids lack the secondary web. Cirrates are benthic (most Opisthoteuthidae) or bentho- bathypelagic (Stauroteuthidae, Cirroteuthidae,and some Opisthoteuthidae). The benthopelagic species often hover just above the ocean floor with arms and web spread parallel to the substrate (Roper and Brundage, 1972). Apparently, they slowly drift while attempting to detect and capture prey with outstretched arms. 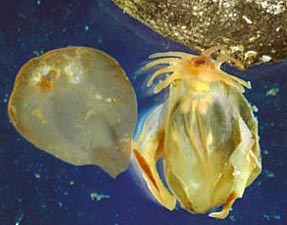 Benthic opisthoteuthids feed on benthic crustacean and polychaetes (Villanueva and Guerra, 1991) while the pelagic cirrates feed, where known, mainly on pelagic copepods (Vecchione, 1987). Cirrates are deepsea octopods that live in all of the world's oceans. They generally occupy depths from about 100 to over 5000 m although they have been found in surface waters in Polar regions. Their maximum known depth of occurrence is over 7,000m, the deepest record for any cephalopod (Voss, 1988). Aldred, R. G., M. Nixon and J. Z. Young. 1983. Cirrothauma murrayi Chun, A finned octopod. Phil. Trans. R. Soc. Lond. B, 301:1-54. Boletzky, S. v. 1982. On eggs and embryos of cirromorph octopods. Malacologia, 22: 197-204. Boletzky, S. v., M. Rio and M. Roux. 1992. Octopod "ballooning" response. Nature, London. 356: 199. Collins, M. A. 2003. The genus Grimpoteuthis (Octopoda: Grimpoteuthidae) in the North-east Atlantic, with descriptions of three new species. Zool. Journ. Linnean Soc., 139: 93-127. Collins, M. A. and R. Villanueva (2006).Taxomony, ecology and behaviour of the cirrate octopods. Oceanography and Marine Biology: An Annual Review. 44: 277-322. Hunt, J. C. 1996. The behavior and ecology of midwater cephalopods from Monterey Bay: Submersible and laboratory observations. Ph. D. Dissertation, Univ. Calif. Los Angeles. 231 pp. Johnsen, S., Balser, E. J., and E. A. Widder (1999). Light-emitting suckers in an octopus. Nature, 398: 113-114. Nesis, K. N. 1982/87. Abridged key to the cephalopod mollusks of the world's ocean. 385+ii pp. Light and Food Industry Publishing House, Moscow. (In Russian.). Translated into English by B. S. Levitov, ed. by L. A. Burgess (1987), Cephalopods of the world. T. F. H. Publications, Neptune City, NJ, 351pp. Piertney, S. B., C. Hudelot, F. G. Hochberg, and M. A. Collins. 2003. Phylogenetic relationships among cirrate octopods (Mollusca: Cephalopoda) resolved using mitochondrial 16S ribosomal DNA sequences. Molecular Phylogenetics and Evolution, 27: 348-353. Robson, G. C. 1932. A monograph of the Recent Cephalopoda. Part II. The Octopoda (excluding the Octopodinae). Brit. Mus. (Nat. Hist. ), London. Roper, C. F. E. and W. L. Brundage, Jr. 1972. Cirrate octopods with associated deep-sea organisms: New biological data based on deep benthic photographs (Cephalopoda). Smithson. Contr. Zool., No. 121: 1-45. Vecchione, M. 1987. A multispecies aggregation of cirrate octopods trawled from north of the Bahamas. Bull. Mar. Sci., 40: 78-84. Vecchione, M. and R. E. Young. 1997. Aspects of the functional morphology of cirrate octopods: locomotion and feeding. Vie Milieu, 47:101-110. Villanueva, R. and A. Guerra. 1991. Food and prey detection in two deep-sea cephalopods: Opisthoteuthis agassizii and O. vossi (Octopoda: Cirrata). Bull. Mar. Sci. 49: 288-299. Villanueva, R. 1992. Continuous spawning in the cirrate octopods Opisthoteuthis agassizii and O. vossi: features of sexual maturation defining a reproductive strategy in cephalopods. Mar. Biol. 114:265-275. Voss, G. L. and W. G. Pearcy. 1990. Deep-water octopods (Mollusca: Cephalopoda) of the Northeastern Pacific. Proc. Calif. Acad. Sci., 47: 47-94. Young, R. E. and M. Vecchione. 1996. Analysis of morphology to determine primary sister taxon relationships within coleoid cephalopods. Bull. Amer. Malac. Union., 12: 91-112. Page: Tree of Life Cirrata Grimpe, 1916. Finned octopods. Authored by Michael Vecchione, Katharina M. Mangold (1922-2003), and Richard E. Young. The TEXT of this page is licensed under the Creative Commons Attribution-NonCommercial License - Version 3.0. Note that images and other media featured on this page are each governed by their own license, and they may or may not be available for reuse. Click on an image or a media link to access the media data window, which provides the relevant licensing information. For the general terms and conditions of ToL material reuse and redistribution, please see the Tree of Life Copyright Policies.